Thursday Night Flights have started this October. We’re rotating the flight offerings each week, featuring locals breweries and seasonal suds (just in time for Pumpkin Beer season), among others. It’s a great way to try new flavors and learn about the latest trends in craft beer and pairing with meals. We at West on Centre strive to give back to the community that shows us so much love and support. That’s why we’ve started the Neighborhood Nights fundraising series, which has enabled us to support the community in a way we haven’t been able to before. When you decide to participate in Neighborhood Nights for your school, church, or charity, you pick a date that works for your group, any Monday that’s not a holiday, and we’ll supply you with promotional material including a custom Neighborhood Nights “coupon”. On the day of your Neighborhood Night, we’ll donate 10% of sales from all guests who return the promotional coupons to us. We call it Neighborhood Nights, but the offer is good all hours we serve food, 11am – 11pm. It’s good for dine-in, take-out, and tabs at the bar. We help you cross-promote on all of our social media accounts, as well as to our e-mail list of over 4,300 subscribers. We want to maximize the fundraising effort. Best of all, there’s no limit to the amount of funds that can be raised—the higher the tabs, the higher the donation. We’ve found that Neighborhood Nights can generate 4X-5X the funds than gift cards raffled at silent auction. Want to know what we love best about Neighborhood Nights? When you come in to support your kids’ school, your church, or other charity group, you’ll see peers and parents you know coming in for the same cause. It creates a fun sense of community in the restaurant, which is why we call it Neighborhood Nights. It makes raising funds less of a chore and more of a fun social activity. Let me know if this is something you’d be interested in for your group. If so, e-mail a date and we’ll be in touch with your promotional material to get the ball rolling. Appy Hour is here! All appetizers on our regular menu are 1/2 priced when you dine in on Mondays 4-7pm. Want our buttermilk dipped broccoli with sweet hoisin dipping sauce? Half off. How about fresh made guacamole and chips? Half off. And the 13-hour hickory smoked BBQ pulled pork tacos with black beans, pico de gallo, and cilantro lime crema. Half off. They’re all half off! Stop by after work and have a small bite for small bucks. 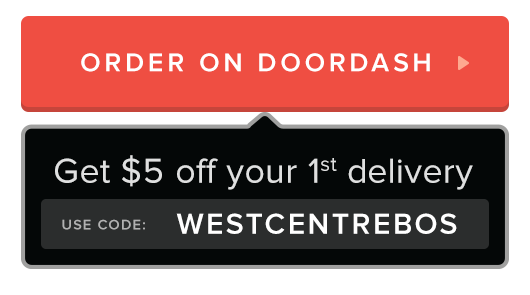 West on Centre is thrilled to now be offering gluten-free pizzas. Now all of our pizzas are available on a 9-inch pizza crust that is entirely gluten-free. There is no additional charge to make the substitution. We searched the GF market far and wide to find a crust that we think really makes the cut. Come in and try one today. As always, please inform your server if you or anyone in your party has a food allergy before ordering. Our wildly popular Sunday Brunch is now available on Saturdays! Get brunch from 10:00am to 3:00pm Saturdays and Sundays. If you’re hankering for some eggs during the week, call ahead for our specials. We almost always have an omelet special ready for you, especially on holiday weekends!